If you looking for a special, far away from the masses, then the Villa Sanssouci is the right choice in Palheiro Village. 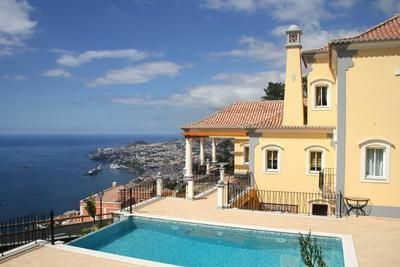 Breathtaking views over the Atlantic and the capital Funchal are enjoying all Rauemlichkeiten. The private heated swimming pool and sauna leave nothing to be desired. Three bedrooms all with en-suite bathrooms or speak on its own terraces. A very geschmakvolles living room with open kitchen-living room and approximately 100m2 living space is ideal for families and friends. By Inside Lift to reach all three floors. Complete with laundry (washing machine and dryer). A villa like the fairy tales with over 500m2 of living space awaits you! Welcome to Palheiro Village, welcome to Villa Sanssouci. Funchal is a dreamlike, more beautiful city. Kulter, shopping facilities, such as good restaurants are available here. Especially, a very safe city. A luxury! By car you can reach Funchal in 10 minutes. A rental car is recommended for Palheiro Village.